The three sisters grew up not knowing their father and not quite catching a break. But it looks like their luck is about to change when they find out the secret identity of their long-lost dad�a billionaire Las Vegas hotel owner who wants them to come live in a gorgeous penthouse hotel suite. Suddenly the Strip's most exclusive clubs are all-access, and with an unlimited credit card each, it should be easier than ever to fit right in. But in a town full of secrets and illusion, fitting in is nothing compared to finding out the truth about their past. Peyton, Courtney, and Savannah are three sisters growing up in a middle of no where city in California. They live with their mother and have never really known their father. Their life with their mother isn�t easy, and sometimes they�re struggling just to make ends meet especially when their mother winds up on one of her drinking binges. Ultimately, one of those drinking binges has devastating consequences and their mother and hauled off to rehab, and the three sisters are shipped off to live with the father they have never known. Not only are they shipped off to live with the father they�ve never known but it turns out their father is a very wealthy man. He has money that they had only dreamed of having, and he lives in Las Vegas. The three sister�s whole world is changed as they are thrown into the middle of all the glitz and glamour. Suddenly, they have more money then they know what to do with and are living in a casino owned by their father. It really is life changing for them. �And of course with all this glitz and glamour also comes a whole bunch of secrets and lies. The three sisters are complete opposites. Peyton, the oldest, has a rebellious spirit. She does what wants, wears what she wants, and doesn�t care what anyone thinks of her. The middle sister Courtney is more focused on her education. She studies hard and works hard to get into the college of her dreams (Stanford). Comparatively, Savannah is the dreamer of the group, and as the youngest has a very na�ve spirit that causes her to get hurt easily. Each o the sisters responds differently to the news that their father is Aidan Diamond, billionaire and owner of Diamond Casinos in Vegas. Each of their responses felt genuine based on their personalities. I really liked how all the personalities were so well developed. It was easy to tell each sister apart � and that worked really well for the multi-narration technique which was used throughout the book. There is also a fourth narrator named Madison, who is the classic popular girl, trying to hold onto her territory as she feels threatened by the arrival of the Diamond sisters. There is a bit more to Madison then just the classic popular vibe but I don�t want to give too much away. So those were the positives — I liked the strong writing and for the most part I liked the characters — but I wish that there had been more of a plot for this. I know it�s the first book in the series, and I�m hopeful that there will be more of a plot in the next one as this one was more like foundation but still I felt like it was missing something. There was so much focus on romance, and while I understood the whole �getting lost in Vegas� vibe, I couldn�t help but think that more could have been done outside of that. I also didn�t care for the way that the sisters were always being compared to the �regular� crowd in Vegas. Yes, they were outsiders but at times it almost felt like the pointing out of their �flaws� was overdone a bit. There was a hint of shame to it and to them being who they are which I really didn�t care for at all. I don�t like the hidden shaming of female characters especially when it might send the wrong message to the reader. Still, I�m hopeful that as they learn to adjust to their new life in Vegas, Peyton, Courtney, and Savannah will be able to fit in without having to give up what makes them really interesting characters. 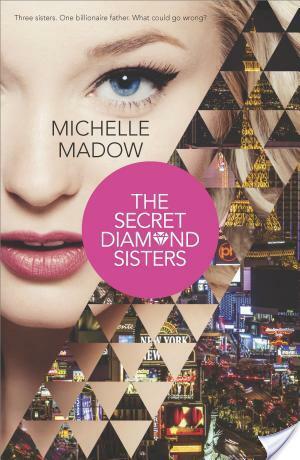 I also felt like the �big secret� of The Secret Diamond Sisters was lost in translation somewhere. At the beginning, there were all these hints as to why their father never actually contacted them (beyond the story that he told them) but overtime that was dropped to the wayside which was disappointing. At first I wanted to know what the secret was because I felt that it was going be intriguing and make the story even more interesting. I honestly think I would have rather learned more about the secret than about all the different romances and hook ups that were present in the story. Maybe it will get picked up in the second book? All in all, The Secret Diamond Sisters was an admittedly fun read. It�s a bit incredulous but I think that might be what makes it fun to read. It�s one of those books that takes you to a place that you may never have been, and allows you to imagine what could happen if you were just allowed to roam free, and do whatever you wanted. While everything didn�t click in an entirely positive manner, I still applaud Michelle Madow for her writing skills, and I do think I will have to continue with this series in order to know rather or not Peyton, Courtney, and Savannah have survived their Vegas lifestyles. I really wanted to love this one, but I didn’t. I agree with you, that there was lack of plot.. I feel like as a first book that should not be the case. I expect that more with a middle book. The Secret.. that was lost to me too. I think this would have been a fun read, but I couldn’t get past the fact that their mom was shipped off to rehab and then the rest of the book is filled with kids underage drinking and partying. That was my main issue, having grown up with alcoholic parents, it just didn’t sit well with me.